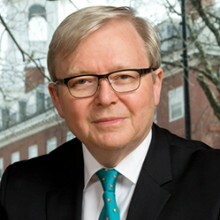 The Honorable Kevin Rudd is President of the Asia Society Policy Institute. He served as Australia’s 26th Prime Minister (2007–2010, 2013) and as Foreign Minister (2010–2012). He led Australia’s response during the Global Financial Crisis, reviewed by the IMF as the most effective stimulus strategy of all member states. Australia was the only major developed economy not to go into recession. Mr. Rudd helped found the G20 to drive the global response to the crisis, and which in 2009 helped prevent the crisis from spiraling into depression. In his private capacity, Mr. Rudd established the Australian National Apology Foundation to continue to promote reconciliation and closing the gap between indigenous and non-indigenous Australians. He has also established the Asia Pacific Community Foundation to promote the cause of regional economic, security, and environmental collaboration across the region.